With notable exceptions, I don't enjoy comics based on non-comic properties and don't seek them out. There are a whole host of reasons. There is my admittedly nerdish concern about whether or not the story will be considered to actually have happened in whatever mythology it's based on. If the comic is simply an adaptation of a movie or TV show, then I feel like it would serve me better to see the original with its added elements of motion and sound. It's difficult to imagine, for example, a Darth Vader with word balloons would ever trump the original, or that it could evoke the same terrible majesty without the immediately recognizable musical score or the labored mechanical wheezing. Of course, there's always the concern - sound effects or canonical issues aside - that a creative team other than the one used to handling the specific property just won't be able to pull it off. Thankfully, very little of the above applies to Joss Whedon's Fray. 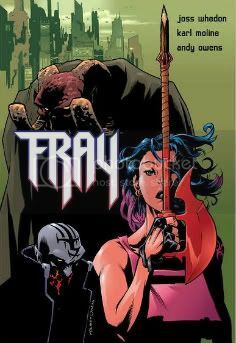 Though based on the mythology of Whedon's Buffy the Vampire Slayer, Fray is set centuries in the future, in a world that has forgotten about magic and vampire slayers and, most dangerously, the vampires themselves. Vampires still exist but they are called "lurks," and while they're considered unsavory and unpleasant, no one worries about them too much and they're assumed to be nothing more than junkies. Melaka Fray is a tough-as-nails thief who has never questioned her extraordinary abilities, but instead uses them to work for the aquatic mutant mobster Gunther. Unbeknown to Fray, the vampires are about to rise under a powerful new leader, and with the Watchers Council filled with ineffectual lunatics, the only one who can find and teach Fray how to be a slayer is the hulking, horned demon named Urkonn. Melaka Fray is no Buffy Summers. She's more reminiscent of Faith and, to a lesser extent, the alternate reality version of Buffy in "The Wish." Unlike the cheerleader-turned-warrior, Fray is part thief and part enforcer for her mutant boss Gunther, and as such she was inducted into the world of violence long before she ever heard the phrase "vampire slayer." Unlike Buffy who had friends and family, Fray is mostly alone. She is the idol of the one-armed pre-teen Loo who follows her around and sings Fray's praises incessantly to anyone who will listen, and Melaka's older sister Erin - a police officer - blames her for their younger brother's murder, rarely sees Melaka, and when she does it's usually to browbeat her for the criminal life she's chosen. That's about it. No Willows to sedate, no Xanders to issue protective goggles, and thank freaking Hulk, no little sister Dawn. At first, Fray couldn't care less about Urkonn or anything he has to say and doesn't believe him. It isn't until a 300 pound vampire attacks her during a heist that she reconsiders and asks the demon to train her. When she's captured by the vampire leader, she learns her brother's murder had more to do with her Slayer-ness than she ever realized. She escapes, assembles a rag-tag group of citizens to fight at her side - including her sister and a dozen or so cops in flying cars - just in time to fight the vampire horde and a Godzilla-sized demon ready to spawn baby Godzilla-demons all over the damn place. After taking down the Big Bad and saving the world, Fray has one final, surprisingly vicious loose end to tie up. Whedon's world-building skills are wonderful. Eight issues isn't a terribly long time to build a futuristic world and by the end of it you certainly don't feel like you could write a comprehensive guide of the place, but you definitely get the sense you know where this slayer is living. Like in Firefly and Serenity, Whedon's love for coining new slang serves him well in Fray. When you read certain Fray-specific lingo, it makes perfect sense and you intuitively map out the corruption of words like "horrorscope," but the lingo isn't so dense that it takes all your attention to sift through it. Whedon's trademark humor is also in full swing here, his timing as perfect as it was on Buffy and Firefly. Karl Moline's dynamic action sequences are wonderful, and unlike a lot of artists on comics based on non-comic properties, he doesn't have to draw the actors playing the characters in those properties. He doesn't have to draw Gellar or Boreanaz or Marsters and therefore doesn't have to walk that tightrope of drawing them too much like the actor or not enough like the actor. However, one of the interesting things I noticed upon rereading Fray for this review was how the drawings of certain characters suggested associations with the Buffy TV series. For example, the demon Urkonn is really nothing like Rupert Giles, but he's just about the closest thing to a Giles-like character in the comic simply because he's Fray's mentor. It's tough to believe then, that it was a mistake that Urkonn is a huge, horned demon just like the huge, horned demon that Giles was turned into in Season 4's "A New Man" (though I guess quite a lot of demons are both huge and horned, but still). Likewise, Fray is a dark-haired, violent criminal. Her blond sister Erin, on the other hand, is the responsible one who wants to put her sister in jail "for her own good." It gives the impression that one of Whedon's goals with Fray was to turn the Buffy/Faith relationship on its head. Fray is, after all, different from Buffy in all the ways that Faith was. She's alone, wild, unapologetic, and revels in her power in a way that Buffy never could. The plot has some echoes of the TV series of course, but specifically of the fifth season. One thing I won't mention because it's a fairly big spoiler, but suffice to say that we eventually learn a character was killed in order to motivate Fray, and there's something about it that feels a lot like the argument Giles and Buffy had in the very beginning of "The Gift" - the final episode of the fifth season. But there also may be a literal connection. I won't get specific, but there are a number of hints - some more subtle than others - that Whedon intended a sequel to Fray that would involve Glory, the demon goddess who was Season 5's Big Bad. You can probably tell you're talking to a Buffy fan here, and as a Buffy fan it's interesting how I first reacted to Fray. I immediately liked it, but it was depressing that the world Buffy and her comrades had fought and, in some cases, died horribly to protect had been made into such an ugly industrial nightmare. In spite of how disappointed I was in Buffy's final season, when Urkonn gave Fray the scythe, I found myself feeling shockingly proprietary about it. "You gave her the Scythe? DUDE! She takes showers in alleyways! Do you know what Buffy went through to get that thing?! You can't give her the--oh, do NOT tell me she is holding it by a strap of cloth on her effing tanktop--I can't look. I can't look." Of course, Melaka Fray eventually proved herself worthy of the blade just as Fray is worthy of the slayer mythology. While I have not yet been able to read much of Buffy the Vampire Slayer, Season 8, before it came out Fray was the only Buffy comic I gave a damn about. All of the other Buffy comics I found were indicative of what I wrote earlier about not being attracted to comics based on non-comic properties. Most of the creative teams of the earlier Buffy comics tried and failed to ape the show, and I find it wonderfully ironic that when Whedon got the reins of a Buffy comic, he turned it into a Buffy comic that wasn't a Buffy comic. I don't know if there are, or ever were, plans for a Fray sequel (I know she made an appearance in the Season 8 comics, but I haven't read them), but the potential is there. Hell, I think the potential is there for a Fray ongoing. I never took the chance to watch as much of Buffy as I should have; I had no idea back then that it wasn't just a weird, unfunny series based on the movie I thought was mediocre even before I used the word "mediocre." Even so, you make me want to read this and watch the whole series... Dangit. Rob, thanks for saying so, and I fully support you reading/watching both.